That statement, however, is not entirely true. It rains more in Ketchikan, Alaska than it does in Forks, Washington. Forks has an average yearly rainfall of 120 inches. In a really wet year they’ve had as much as 160. Ketchikan, on the other hand, has an average yearly rainfall of nearly 160 inches, about as much as a record year for Forks. 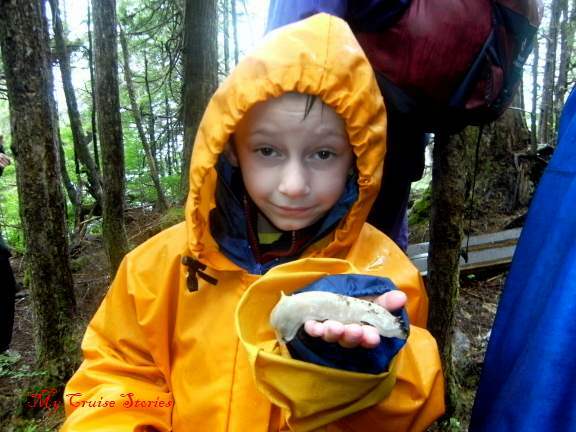 In a record year Ketchikan got over 202 inches. Par for the course, the Norwegian Sun arrived in Ketchikan on a rainy day. On a later-season visit there the next year on the Safari Quest, I did manage to see Ketchikan in the sun. Since we had a group of three people on a cruise with three port stops, each of us picked a shore excursion for one stop. 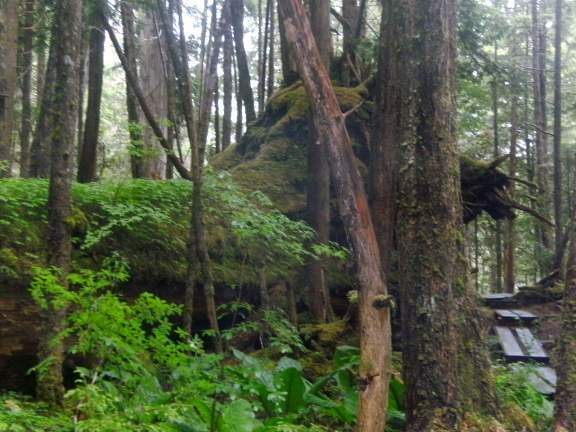 In Ketchikan, Chris picked a rainforest hike. In a parking lot next to the cruise ship dock, we found the bus for our tour. Although there on time, we were the last to arrive. We still managed to find seats together on the bus, which took us to a marina. 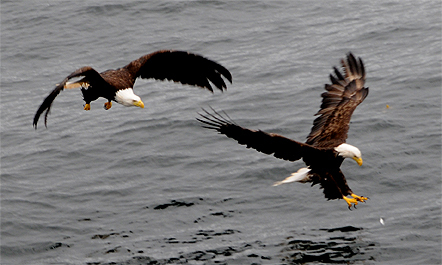 Bald eagles flocked around that marina the way seagulls flock around the marinas at home. One sat so still on the top of a nearby piling for so long it looked like a carving on the top of the pole – until it flew away when approached with a camera. What happens in a rain forest? Mostly rain. After giving everyone a chance to use the restroom, the tour guides fitted each person with brightly colored raingear. The colors varied with each size, an easy system for them keep everything of the same size grouped together to make assigning gear to their frequent tourists a fairly quick procedure. While we all donned our much-needed protection from the day’s weather, the guide made a comment about 3 weeks of unseasonably nice weather having just ended. Oh well, it is a rainforest after all. We got rained on in the rainforest in Australia, (yes Australia does have rainforests.) Might as well get rained on in the rainforest of Alaska as well. The guides escorted our group down a dock where we all piled into a very large inflatable boat. Looking at the people around us we noticed that not only was Justin the only kid, but other than him and Chris, I was just about the youngest person there. (I’m fairly young as far as grandmothers go.) A bit surprising for a hike. Passing by the shoreline of a neighboring island, we saw a moose standing near some trees above the beach. Most of Alaska is fairly remote, although some places are more remote than others. Near to a city wild places need protection even there. The island where we landed is not only uninhabited, but also requires permission for hiking. Something the tour people take care of, cruise ship passengers just pay for the excursion and let other people deal with the rest. We all climbed out of the boat and onto the beach. Then the group set off into the woods single file on a boardwalk trail. Apparently south-east Alaska has a lot of boardwalk trails. I suppose they need it on the boggy ground from all that rain. While we walked through the forest, the guides talked about the things that grow there. Much of south-east Alaska is part of the Tongass National Forest, the largest National Forest in the US. It is part of the larger Pacific temperate rainforest ecoregion. The main tree species growing in the Ketchikan area include Sitka spruce, western hemlock, western red cedar, and Alaska (yellow) cedar. 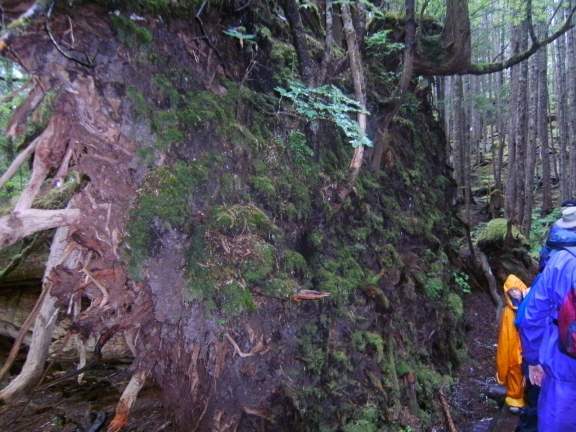 Although logging this remote region is no longer profitable, and actually sustained by government subsidies, logging continues into old growth forest areas not protected by wilderness status. Near Forks in the Hoh Rainforest of Washington State, in addition to the Sitka spruce, western hemlock, and western red cedar found in Alaska, the forest also contains Douglas fir (the predominant tree of most of western Washington) as well as some deciduous trees like cottonwood and several species of maple. In the greenish light filtering through the canopy of the rainforest trees we saw giant rootballs of large trees upended in winter storms. These fallen trees become nursery logs as the next generation of trees grows on top of them, attaining their nourishment from the log in their early years before their roots reach the forest floor. Lots of moss grows everywhere, although trying to determine north by the moss on the trees doesn’t work well there as it grows all the way around them. Large fungi often protrude from the trunks. At one point the guide stopped the group to view some local wildlife. He’d spotted a banana slug just off the boardwalk. He convinced a skeptical Justin to hold the banana slug. Apparently he enjoyed it as he developed an affinity for slugs from that point forth. For awhile after this trip, often times after he came for a visit I would find a little brown slug on the swing in the yard. Somehow I really don’t think slugs enjoy swings. They do enjoy the plants in my garden though. At the end of the hike we stopped at a small clearing in the woods where one of the guides had stayed behind and made a campfire. Everyone sat around the campfire on logs circled there for that purpose nibbling on snacks and sipping hot drinks. Well almost everyone. As usual, Justin couldn’t find so much as a cracker to his liking, and he’ll never drink anything hot. They might have come up with some juice for him, but I don’t remember for sure. After a boatride and busride back to the ship, we had some time left in port. We headed out to see the town, but having left the rain gear back at the marina for the next tour, we now got soaked before reaching the first nearby gift shop, so that was as far as we went. We bought a few gifts for people not on the cruise with us, and then hurried back to the ship for dry clothes and a warm meal. Ketchikan has a large visitors center right near the cruise ship docks that can set people up with a variety of tours. Ships also offer an abundance of shore excursions including tours by land, sea, or air, fishing, wilderness adventures, and tours featuring local cuisine, active adventures, native culture, or wildlife. 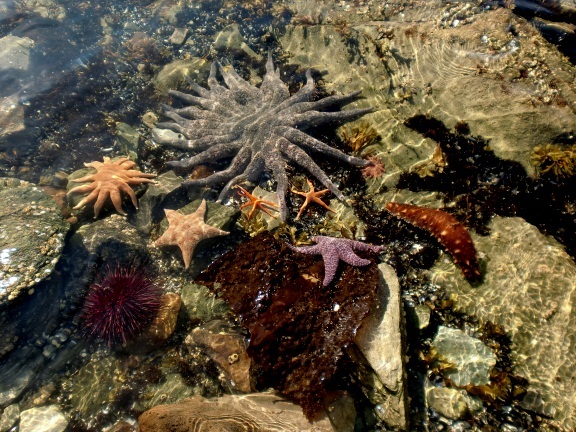 Try snorkeling in a wetsuit where you actually stay warm while seeing what lives under the surface of Alaska’s cold sea. Or maybe a crab boat experience on a ship once featured on Discovery Channel’s Deadliest Catch show is more to your liking. Visit Neets Bay Fish Hatchery by boat or plane, where you might catch a glimpse of a bear come to fish in the river. 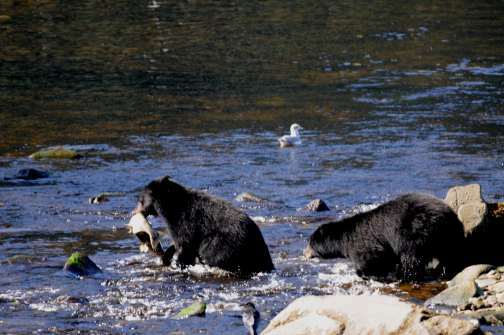 Or you could book a fishing charter and catch Alaska’s wild salmon before the bears eat them. 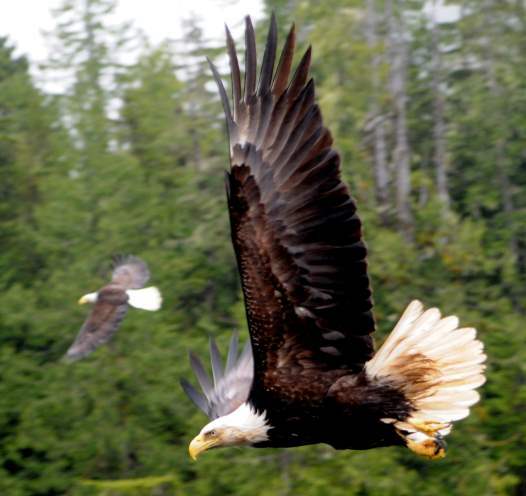 This entry was posted in Alaska, Norwegian, Shore Excursions, Sun and tagged Alaska, cruise, eagles, Forks, hike, Ketchikan, photos, rain, rainforest, travel, trees, Twilight. Bookmark the permalink. Ew, doesn’t holding slugs make your hands all slimy and disgusting, and then you have to wash your hands with that special weird soap? It does make your hands sticky and slimy but normal soap will wash it off.